Independent VR developer Jonathan Ravasz has created a new virtual reality keyboard that provides users of virtual reality headsets such as the Oculus Rift, HTC Vive and maybe in the future the PlayStation VR with a visual input interface that lets you use controllers to type in VR. Check out the demonstration video below to learn more and see the virtual reality keyboard in action. If you fancy using it on your own VR system then the files are available to download directly from the GitHub website. 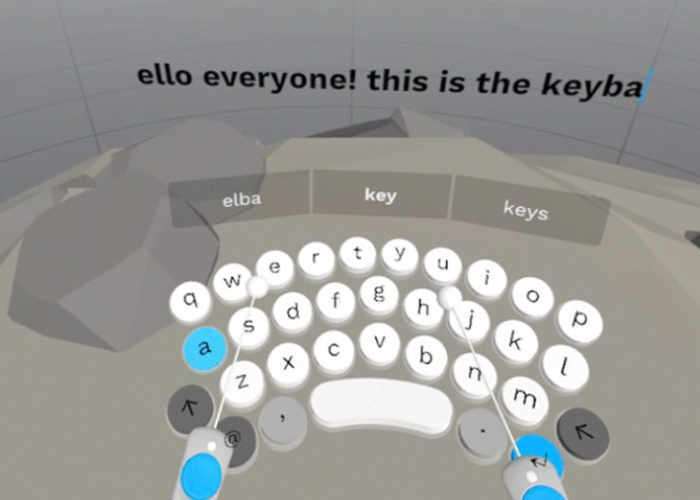 Punchkeyboard is an open-source keyboard for virtual reality, enhanced with autocomplete and next word prediction functionality for a swift typing experience. It was created with Unity and written in C#. The built in prediction is based on Reddit conversations, however the repository contains functionality for creating custom dictionaries for personalised suggestions as well. After testing various social virtual reality platforms, one problem has been recurring at each. These VR experiences often partially rely on real world physical keyboard input. This can be a difficult task for various reasons. The lack of visual feedback of the keyboard and keycaps, and also limiting room-scale VR experiences by a static, stationary physical item. These difficulties motivated me to start working on a new standard for VR keyboard input. I have decided to go with a reduced QWERTY layout similar to the one used for conventional touchscreen keyboard input for saving space. In desktop VR mostly 6DoF controllers are used for interaction. While these controllers allow fairly accurate palm/hand tracking, they don’t have the capability to bring the same accuracy to finger tracking, yet. This limitation results single “finger” per hand typing, similar to the two thumb input on touch screens. For boosting the typing speed up I have decided to implement a next word prediction and auto-complete algorithm supporting the text input in real time. The predicted and completed words appear above the keyboard as text bubbles. The user by selecting these bubbles can easily speed up his/her typing speed. The virtual keycaps are slightly curved around the user, making them easier to reach by the controllers. Each row of keys is slightly shifted vertically in order to avoid double key collisions. I am planning on releasing the VR keyboard on the Unity Asset Store soon, hoping it can become an integrated part of various VR experiences.